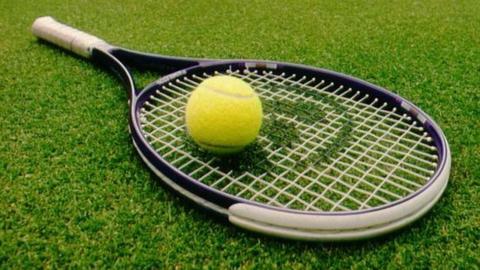 Lessons will be delivered by a team of 1,000 "expert and passionate coaches"
The Lawn Tennis Association plans to hand out 10,000 free racquets and offer 10,000 free junior tennis courses in an attempt to unearth stars of the future. The LTA says it will also take the Davis Cup trophy on a tour to 50 different venues around Britain. The move follows criticism of the LTA from world number two Andy Murray for failing to develop world-class talent. Britain won the Davis Cup for the first time since 1936 by beating Belgium in Ghent in November. "We want to make a difference in capitalising on this unique opportunity to get as many kids on court as possible," said victorious Davis Cup captain Leon Smith. The lessons will be delivered by a team of 1,000 "expert and passionate coaches", according to an LTA statement. The opportunity for children and families to take up the offer will go live before the Davis Cup first round tie against Japan in March.